Above: Photo of Suzanne Wright Crain's altar in progress. Deep work and deep play took all of us into wonderful work this past weekend. Here are some photos of artists at work -- some made altered books, some altars. Everyone, including me, found some insights pertinant to our particular time, space and needs. Robin Early and Suzanne Wright Crain and Martha Grant work on their Archetype projects. As we looked at various approaches to exploring our "inner teams," I had found some work by creativity coach and author Eric Maisel that shed light on the ways identity as an artist (or should I say identities) can both help and complicate our work, identity and paths. Am I artist the beautifier, artist the visionary, artist the businesswomen, artist the producer, artist the activist...?? Certainly teaching a workshop such as this Archetype workshop calls on my skills as teacher and mentor, while I also try to do my own work ast least part of the time as a way of modeling and demonstrating the processes and products involved. 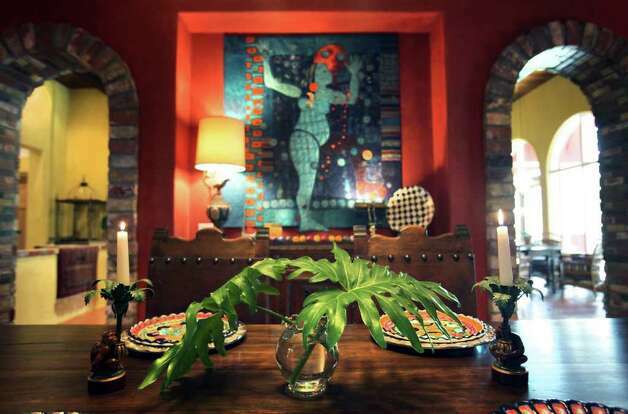 Then, as the weekend came to a close, a friend called and told me one of my large textile pieces was included in a "home" section report in the San Antonio Express News. I called the collector and thanked him (and his wife Suzi) for giving the reporter my name (read the story for more info!). Ah, another artist identity -- published and out there. The dining room in the home of Suzi and Dennis Strauch, near Pipe Creek, has a quilted piece of fabric art on one wall. The planning wall has finally come to life! Well, almost. At any rate I am to the point of taking registrations of my test pilot group. Here are the details (if you expressed interest before, you should have gotten an email today). The test pilot group will be open to the first 25 participants who respond. I don't think I can handle more participants than that and still do a good job of facilitation with the level of participation I hope we have. You have expressed interest in being one of my "test pilots" for a new on-line teaching format and for an online workshop that I will facilitate. After a busy winter season teaching and learning I am ready to launch the workshop, with the start date for the first week of classes set for Thursday, April 1. The online workshop will last for 7 weeks (the last week is optional since it involves more expensive materials and equipment), but I would like this free trial to have participating artists who can commit to at least the next 6 weeks to work through the exercises, or, at the least give me feedback as to the format and content. Week Two -- Cut and Paste, Word Collages. Week Three -- From Text to Textile. Week Six -- Putting it all together. The online workshop will be offered on a private, password protected website with another password protected website that will be used for comments and discussion hosted on posterous.com. There will also be pdf downloads of lessons, supplies, etc. (It may take me a few weeks to get them formated for download). The workshop will be conducted through these two online web-based platforms. If you do not have highspeed internet service I suspect the process will be too tedious for you to use. In the future, perhaps I will also offer the workshop as a CD or DVD. You will need to know (or be willing to learn) how to post comments on a website, send email to posterous, shoot and download photos into your computer of your work to share, attach photos to an email, search the web, set up bookmarks on your web browser. You will need a computer and printer/scanner if at all possible, and I reccommend that you have an all-in-one copier/printer though this is not essential. If you are accessing the workshop on a public computer, you must have the ability to log-in to password protected sites. I am not, for this first trial, providing any supplies or material kits other than an option for you to order thermofax screens from me. Supply services may be added in the future. PLEASE respect my ownership and copyright for these materials and use them for personal use only, not for distribution. Do not share your confidential password and log-in information with others. The password will be changed every three months, so if you wish to participate in comments or review the materials, be sure to do so within that time period. Fully participate in group discussions, including posting examples of your work (photos), ideas, things you discover about the techniques and exercises, etc. Your comments and posts will be submitted via a separate but linked website on posterous.com. This means you simply will email photos, comments, etc to a dedicated, private website, accessible only to the members of this pilot course. Each lesson has a live link to the posterous site. I would like the option of using your submitted examples on future course websites and to illustrate exercises, and will credit your work with you name, if you wish. See the first assignment. Stay the distance, at least through the next 6 weeks of lessons. I will post one lesson per week. Each lesson includes several assignments-- some design exercises as well as some technical “how-tos.” You can, of course, complete the assignments (or not) at your own pace and in your own good time, but discussions will track the course timeline and weekly lessons. I will also make all the written lessons available as pdf formated downloadable documents, so that you can keep them handy as you work and for future projects. At the end of each assignment, you’ll find a checklist that you can use to monitor your progress. Participate in an evaluation at the end of the workshop so that I can improve and make the materials better and more useful. VERY IMPORTANT!! Share your experience with others, so that when I offer the tuition-based version of the workshop, I have you as an ambassador to help me market the workshop online and to the groups that you participate in. If this still sound like fun, please send me a prompt email return and I will mail you the registration information, password and links to the sites. Thanks for sharing the adventure!